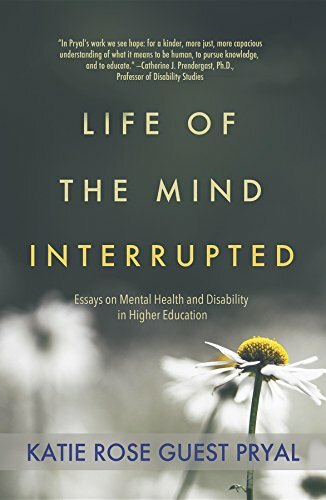 cover of Life of the Mind Interrupted: Essays on Mental Health and Disability in Higher Education by Dr. Katie Rose Guest Pryal. The top half is a darker gray with the title in yellow, and the bottom half is a close-up of white flowers. My friend nodded. She’s disabled, too. She gets it. We both earned Masters Degrees. We both got sick, faced hospitalizations, survived manic episodes and more — all while trying like hell to churn out good work and not scare off our classmates and professors. When I said, “I would probably be in bipolar crisis,” I didn’t mean I couldn’t do a PHD program. I meant PHD culture is toxic to people with disabilities. Before I delayed my admission (and later dropped out), I had pursued accommodations for my assistantship. At one point, Human Resources point-blank asked me how I ever expected to work in academia given my limitations & needs. When I said I had no intention of ever pursuing a career in academia, they were relieved. “You are much more likely to get the accommodations that way,” I was told. Which is why when I learned Dr. Katie Rose Guest Pryal had written Life of the Mind Interrupted: Essays on Mental Health and Disability in Higher Education, I was ecstatic. But I feel anxiety for another reason as well. I have a psychiatric disability—that is, a mental illness—that I’ve kept secret since I was diagnosed at the age of 21. So when the teaching evaluation called me “emotionally eratic,” I feared that my supervisors would believe the words. And, despite all evidence to the contrary, I feared that Mr. Eratic might be right. Mostly I feared that everyone at work would learn about my secret disability, and that I would get fired because of it. I feared I would be seen as unreasonable, irrational, and therefore unable to do the work required of a professor. Because of my disability, my career would be over. Much of Life of the Mind Interrupted draws from her columns in the Chronicle, as well as other essays, with updates and expansions. Covering everything from the tenuous, terrifying tightrope walk of adjuncting-while-disabled to practical advice for classroom accessibility, Dr. Pryal not only dismantles academic ableism; she makes the case for how easy it is to be accessible — and how it benefits everyone. Sak’s advice is written from the position of a tenured professor, with great academic privilege, the most important one being near-bulletproof job security. But there are other privileges that come with the type of job she holds. For example, she gives the following advice to professors with mental illness: “Schedule your courses carefully. If your meds make you tired in the morning, try not to teach morning classes. Try to choose courses you like to teach — you will do a better job and feel less stressed.” As any contingent professor knows, we often choose neither our courses nor our class meeting times. The first time I sought a scheduling accommodation as an adjunct, I lost my job. I was teaching online, and each class included a live weekly webinar. I always selected sections with daytime or early evening webinars: late nights = seizures. When the department overhauled the scheduling system, instructors lost control over seminar times, and I was forced to seek accommodation. My department’s response? Tell fellow faculty about my epilepsy, beg for a daytime seminar, and hope for the best. Epilepsy comes with serious stigma: People think you are devious, crafty, lazy, dishonest, and dangerous. They doubt your intelligence, too (never mind intelligence is itself an ableist measure.) I’ve been called “idiot” or the r-word a lot when people find out about my seizures. I wasn’t fired. Oh no, they knew enough not to outright can me. Instead, they withheld information, resources, and student contact lists, making it impossible to fulfill my duties. If I emailed my director with a question, he would critique my email instead of answering. “Learn how to write shorter emails,” he quipped once, after I sent him two paragraphs detailing a complex & urgent issue with a student. He was calling into question my competence, just as I had feared. The saddest thing? None of it had to happen. The original scheduling process was accessible: We chose our times and that was that. No scheduling accommodations needed. But the accommodations model requires us to disclose our disabilities, it requires us to explain, to give up secrets we might not want to share. The accommodations model depends on invasions of privacy to work. Accessibility, alternatively, means that a space is always, 100% of the time, welcoming to people with disabilities. Accessibility means that ‘accommodations’ are integrated into a space and are not particularized to an individual–but rather created for our society as a whole. We, as a society, are disabled people. Therefore we, as a society, build spaces and procedures for disabled people. And she shows how simple it can be with her “universal design alternative to the whiteboard,” in which she projects a blank document from her laptop onto a projection screen and writes a daily “class record.” Each week, she saves the file and emails to the entire class. “And my students really got into it,” she writes. “‘Put that on the class record!’ they would request during class, when I said something they found particularly helpful.” This was all in response to a student who couldn’t see the whiteboard and requested lecture notes in PDF. Accessibility benefits everyone. No barriers. No documentation. No invasion of privacy. That last bit is key. Remember I mentioned my PHD assistantship accommodations? To get those, I not only had to declare I wasn’t pursuing an academic career; I had to turn over medical records and discuss — at length — my mobility limitations, mobility aids, and medication side effects. The medication side effects turned out to be more important than my actual disabilities: Side effects are easier to understand, easier to “prove,” and easier to accommodate. It was awkward and invasive. I felt like I was talking to a medical assistant, not my HR department. And what about instructors and students who lack access to medical care? Or women of color, whose pain goes disbelieved, denied, and untreated? Transgender colleagues and students, who face misgendering and abuse at the hands of doctors? The very concept of “documented disability” is exclusionary so long as access to documentation isn’t equal. When I was a graduate student, a faculty member joked that proximity to a certain faculty member caused a couple seizures. The implication: my seizures are sexual. I don’t think anyone would have made that joke if I were a man. Probably my favorite essay is “Breaking the Mad Genius Myth,” about Kurt Cobain and the romanticization of mental illness as “genius.” Of all the myths about mental illness, this one has done me the most harm: Bipolar robs me of credit for all my hard work. Don’t ever take medication, people will say. It will ruin your writing. They are wrong. As Dr. Pryal argues, creative people are more productive when their psychiatric symptoms are under control. For years, I bought into the myth, though. I believed medications dulled my shine. Now I know better, but I still have to listen to people deny my hard work and praise my epilepsy & bipolar as “genius.” At the same time, literary colleagues have outright accused me of exaggerating my experiences because they perceive me as “that unreliable crazy person.” That’s the problem with “mad genius.” It’s inherently “unreasonable,” as Dr. Pryal points out. The whole “genius” of it lies in being beyond “normal” reason. While the myth of the “mad genius” romanticizes mental illness, the taboo around suicide & suicidal ideation is strong as ever. As Dr. Pryal writes in stunningly honest, heartbreaking prose, “Suicide didn’t almost kill me. The taboo did.” Taboos make us keep secrets. Taboos keep us from seeking help. Taboos keep us from asking for what we need. Now imagine your career depends on living the “life of the mind” and you’re suicidal. Which is why I am recommending Life of the Mind Interrupted to everyone.